BECKMAN CROWN BREWING COMPANY S.A. is a brewing company established in Haiti in 1991. Dr. Boulos holds a degree in pharmacy from the Faculty of Medicine and Pharmacy of the State University of Haiti. He also studied two years in business administration at the University of Maryland. He is a member of the Chamber of Commerce and Industry of Haiti and a founding member of Haiti Democracy Project. Hotel Olofsson, a late-nineteenth-century gingerbread house and former home of Haitian president Villebrun Guillaume Sam, has been operating as hotel since the 1930s and made famous by Graham Greene’s novel, The Comedians. The twenty-room hotel, closed in 1986, reopened under Mr. Morse’s management in 1987. The Olofsson, which received reviews from the New York Times, the Los Angeles Times, the Miami Herald, Business Week and the New Yorker Magazine, is a city landmark and has attracted over the years literary luminaries such as Tennessee Williams, Truman Capote, Somerset Maugham, and many others. Mr. Morse is the founder and manager of the internationally known fifteen-member music group, RAM. The group has performed many concerts in jazz festivals, in New Orleans, West Palm Beach, Florida, and most recently, at the Edinburgh French Festival. Richard Auguste Morse holds a BA in anthropology from Princeton University. 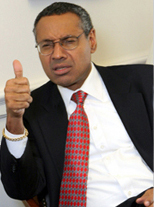 He is a consultant on Haitian public policy and politics to a number of Haitian and American firms and institutions. Since 1993, he has led more than thirty delegations of business leaders from Haiti on fact-finding visits to Washington, D.C. Mr. Delatour has received his undergraduate degree from the School of Foreign Service at Georgetown University (Washington, DC) and holds a master's degree in public administration from the Kennedy School of Government at Harvard University (Cambridge, Massachusetts). Lionel Delatour is a founding member and past president of the Centre pour la Libre Entreprise et la Démocracie (CLED) and presently serves as its elected Secretary General.